The mid-July morning broke clear, warm and golden. The country roads, flanked by trees, shrubs and farmers’ fields, were still and quiet. Only two noises broke the early morning silence - the rhythmic sound of a young woman’s sneakers pounding the pavement, and the quiet melody of deep, regular breathing. My feet. My breath. My companions since 4:00 that morning when I had strapped on my shoes and headed into the darkness. Ahead, a burgundy Honda Accord made its way along the empty road towards me. It passed, turned around, and began to follow beside me, crawling slowly along. A hand emerged from the driver’s side window; a friend’s hand, camera turned on, recording the moment. 300 yards, 250, 100…ahead was the parking lot that would mark the end of the journey. 50, 35, 10, zero. Flushed with elation, joy and astonishment, I sank into the pavement. 22 kilometers of non-stop jogging. And this from someone who just three years before had been barely able to run for 60 seconds. Sickle Cell Anemia is a disease mentioned in many human biology textbooks. You read about it, then turn the page and move on to the next topic. But no page turn could release me from the realities of that illness. They were my realities because it was my disease. Pain, exhaustion, trips to the hospital and blood transfusions were a familiar reality. And all the while, the risk of pre-mature death shadowed my every step. But as one year melted into another, I learned how to live with Sickle Cell, how to maneuver around it. This was me. This was my life. I could deal with it. I would be ok. I had a genetic illness with no ready cure that brought suffering and death to millions. This was my reality, and there was nothing I could do to change it. Time passed. From university I went on to law school and after three long years, prepared for and took the bar exam. But exam preparations put my body under tremendous stress, and soon, my illness flared. Night after night I was in terrible pain, and my medications were useless to stop it. Finally, after one particularly terrible night, I asked my mom to take me to a local hospital. I stared, hardly believing what I was hearing. Days later, a test was mailed to my brother. Two weeks later, the results came back – he was a perfect match. One year later, I sat and watched as my brother, braving the pain, inconvenience and difficulties of the process, gave the cells that would change my life. My run on that warm July morning, one of the greatest victories of my life, was made possible because someone did something for me I could never have done for myself. My transplant changed my blood type from B+ to O+, removing the disease that had caused so much suffering and making a new reality possible. Helpless to healed! And all because a stranger in a waiting room made me an offer I could never have dreamed of, and a brother shared himself with me. But when the run was over, when I came home and put my shoes away, I returned to a life in which violence, destruction, uncertainty, poverty and distress pressed in on every side. Just six months before my run, a young man entered an elementary school and took the lives of 20 innocent school children. Three months later, two individuals detonated bombs at the Boston Marathon, spilling the blood of the innocent all over the streets of the city. Two months after my run, 62 individuals were killed in an attack in a mall in Nairobi. Two months later, Typhoon Haiyan descended on the Philippines, claiming the lives of over 6,000 people. The lapse of days, months and years has only brought on more and terrible events. But while we as a people try to secure ourselves against these external crises, another storm rages on. This storm is harder to escape, harder to ignore. In the tears that fall from my own eyes when no one is there to witness is seen a struggle familiar to many. It is the struggle with discouragement, failure, anger, fear, depression, addiction and loneliness. In that struggle, the victory of a 22 kilometer run rings pretty hollow. But in these moments, I have learned something about myself – something more serious and more difficult than the reality of my physical illness. I have learned that inside, I am messed up, I am broken, and there is nothing I can do to change that. But I have also learned that that is ok, because for the helpless, there is Help. Years ago, a Man did something so remarkable, so earth shattering, that His act would divide time and change history forever. He chose to give a gift that would help all who were helpless and give victory to all who could not fight for themselves. He gave Himself – to live, to serve, to die. Why? Because He understood something about us. He saw that the children He loved were struggling with something that brought suffering and death to all – and there was nothing they could do to change it. And He knew that in Him was the life, victory and healing so desperately needed. So the gift was given and help was made available for all who would simply ask for it. Life is sprinkled with moments of victory. Games won, homes purchased, promotions attained, career breakthroughs achieved, these are the moments we live for. But when the home is purchased, the breakthrough complete and the game is over, what then? 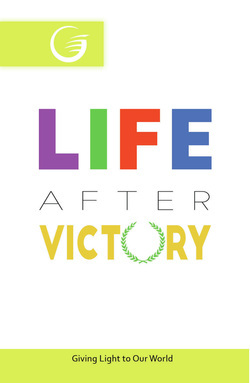 After your victory, to what life do you return? For me, the life I returned to after the victory of my run was filled with darkness and uncertainty. But from those moments I have emerged again and again with more and greater victories; the victory of courage in the place of fear, the victory of joy in the place of sorrow, the victory of freedom in the place of captivity, and the victory of hope in the place of despair. And all this because every day that Man, Jesus Christ, is making my victories possible. Maybe you have figured out how to maneuver around the dangers and sorrows of this life. But if you feel you haven’t, if like me you see that you’re in need of help, He is here for you. So why not begin to learn His story? Why not begin to discover the One who has brought me, and so many others, a life filled with victory? If you are interested, contact us. We have study guides that will help you discover Jesus, and free resources that will give you understanding, help, and hope for your future. This is your time. Contact us today. Tomorrow may be too late.